That’s the perennial question that comes to mind when you walk along Orchard Road and see people ignoring the elderly uncle selling tissue paper, or when you board a train and notice that no one bothered to give up their seats to a pregnant lady. Simple acts of kindness aside, people here seem to have found different ways to make a difference, if the findings of the Individual Giving Survey (IGS) are anything to go by. A biennial study conducted by the National Volunteer and Philanthropy Centre (NVPC), the 2016 findings were released this week. What is the state of philanthropy and volunteerism in Singapore? The Pride susses out five observations. According to IGS 2016, only 29 per cent of those aged between 25 and 34 are current volunteers. While the situation improves beyond this age group, rising to an average of 45 per cent for those between the ages of 35 and 54, it sees a sharp decline to 20 per cent for those who are 55 years and above. Interestingly, those who are preparing for retirement are less likely to be volunteers. 40 per cent of those between 55 and 64, and 53 per cent of those 65 and above are non-volunteers. It may have something to do with the typical life stages of the average Singaporean. The NVPC theorised that at the age 35, most Singaporeans would have stable incomes and established careers, thus freeing up time and resources to focus on non-work efforts like charitable causes and raising a family. As for those in the age bracket of 55 years and above, Melissa Kwee, Chief Executive Officer (CEO) of NVPC shared her compelling theory. After spending decades in the workforce and building up your social networks, one’s identity and sense of worth is arguably linked to what one has has achieved at the workplace. “When these things all cease to be when they retire, what happens?” Kwee questioned. She sees volunteer work as an “opportunity for people to get connected to other forms of social engagement, for giving back to society and being meaningfully engaged in the community”. The idea is to encourage them to expand their social network into the community and redefine work by using their professional skills to contribute to the community in a valuable way. “They will get a real sense of self-esteem from being a positive contribution to others,” Kwee said. IGS 2016 showed that informal giving is on the rise as almost three in four have volunteered or donated without going through an organisation. According to NVPC, this indicates a growing potential for people to start their own initiatives and ground-up efforts. In fact, in two years, the percentage of volunteers who have served informally have doubled – 51 per cent as compared to 25 per cent in 2014. Who says Singaporeans aren’t civic minded? You may even recall some examples of how the community stepped up to hand out free masks during the haze in 2015 and those who distributed food, bottled water and umbrellas to others waiting in line to pay respects to the late Mr Lee Kuan Yew. Kwee commented that the goodness in people is evident during such national events where people are galvanised in times of crisis. But when such national events are few and far between, how can we sustain the spirit of giving without a constant catalyst? As volunteers become more sophisticated, they also become more discerning in their philanthropic acts. If organisations want to keep them engaged, they will need to know how to tailor their programmes to these folks. 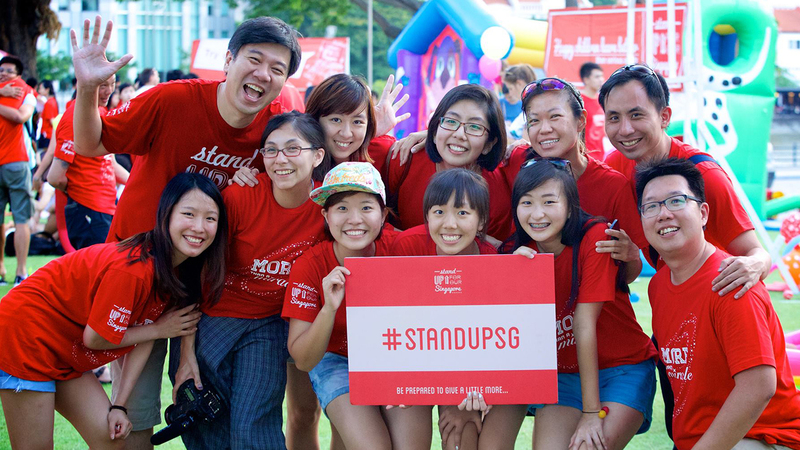 At social movement Stand Up for Our SG, founder Wally Tham has found a way to connect meaningfully with his volunteers. An art programme may typically involve teaching beneficiaries how to sketch or paint and leave the interaction at that. In contrast, Stand Up for Our SG gets art student volunteers to befriend and interact with the elderly and use their friendship as inspiration to create an artwork. Identifying youths as highly passionate and idealistic people with a keen sense of what is right and wrong in the world, Tham explained that the programme sought to challenge the students and get them to act on their idealism. 5. Potential for skills-based volunteerism? If three hours of community singing at a student care centre is not quite your cup of tea, what about making an impact with your skills as an accountant, lawyer or creative thinker? Skills-based volunteerism (SBV) is an emerging form of volunteering that was identified as a good way to capture the younger and older demographics, by letting the former capitalise on their passion to make an impact and affording the latter opportunities to apply their experience to a meaningful purpose. While more on NVPC’s study on SBV will be released later this year, Tan identified the potential for this brand of volunteerism to appeal to people. Acknowledging the “wealth of experience” one would have amassed by retirement age, NVPC wants to encourage people to give back to non-profit organisation through their skills. One such avenue for them is through the Centre for Non-Profit Leadership (CNPL), where NVPC is targeting C-suite volunteers and hopes to “make more board matches between the corporate side and non-profit side”, said Tan. Tying up the five things The Pride learnt in an afternoon about altruism in Singapore, there was one constant that emerged: The people of Singapore do care. After all, more volunteers have been coming forward in the past 16 years, and the total amount of time people here have devoted to volunteering has doubled since 2014. To keep this spirit of volunteerism alive, though, we will need to stir the hearts of the young and older segments and get them more involved. Speaking to The Pride, Kwee urged would-be volunteers to move away from the mindset that volunteering is solely about bringing benefit to others. Instead, the effort becomes more meaningful when we learn to view volunteerism as a “two-way street”, and the one who volunteers can learn and benefit from the process as well. Something to think about for your next charitable project?